Learn from one of the best traps in FFX! This month we have a special treat for everyone! 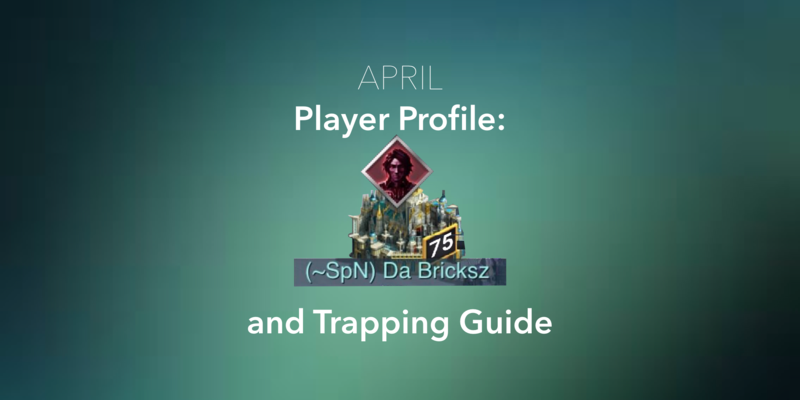 Many of you know Brickz though the various LINE and Discord groups, and know he is an amazing trap! Today, he joins us to discuss a little about himself, and to discuss trapping in the current state of the game. FFXV:ANE HUB: Introduce yourself a bit… Why did you begin playing Final Fantasy? FFXV:ANE HUB: How long have you been playing? FFXV:ANE HUB: What is your favorite part about the game? FFXV:ANE HUB: What is your least favorite part about the game? FFXV:ANE HUB: What is your favorite memory? As a player who mainly plays as a trap, I get a lot of questions from people who would like to learn how to defend like a trap does. It’s can be very entertaining to watch level 100s confused as to how their entire march is swallowed by an empire that’s only level 75. I’ve come up with an advanced trapping and defense guide that is up to date as of April 2019. Iris is absolutely required at this stage of the game as she provides invaluable passive skills. She also taunts a massive 500 million troop capacity at level 250, allowing even low-level empires to have the troop capacity needed to defend. Currently, Iris (with reinforcement) is a better defender than Prompto or Noctis. However, you will need to level her up to 250 to activate her limit break, giving you the best chance at surviving a large rally. Iris’ biggest benefit is her passive/synergy ability which provides boosts to other heroes while active. Luna, Gladiolus, and Noctis have the best synergies to use defensively, with Luna’s (at level 230) being the most effective. We’ll get into more details about why this is below. Luna is easily one of the top defenders once she reaches level 230. Her defensive boosts, coupled with the multi-astral defender, puts the hurt on any attacker. This combination seems to be the answer to a strong attackers Gladiolus level 260+, and the massive march sizes that come with it. Today, it is not uncommon to come across a 9+ million solo march size. Without the massive HP boosts (obtained via Luna synergy, multi-astral defense, and/or high-level defense ministry) a march size close to nine million can obliterate 1.5 million+ undying or shadow guardians in a single hit. Guardians are covered a bit later, but with Luna active, she will bring the wounded rate down significantly and make these attacks more manageable. Note: Make sure to keep Astral heals in plentiful supply, as you must heal all astral after every hit. You can also use Iris’ Hexatheon LB to regenerate astral HP quicker. Noctis synergy provides only a core troop HP boost, which does not help your guardians’ survivability. At this stage he will not be able to defend against a large rally unless the Iris limit break (Moogle Charm) is activated, and/or you have a high level or maxed Defense Ministry. Although Noctis at level 220 is not the best trap hero, and shouldn’t be used to defend against a large rally, his mastery tree is useful for his ability allow you to attack level 8 monsters. Gladiolus, after level 200, offers the large attack boost needed to kill the 9+ million solo marches mentioned earlier. At level 260+ is where he becomes a true lethal weapon with his steal abilities, spiked armor, and Deathblow limit break. Gladiolus should only be used as a trap hero if you are able to supplement HP boosts from other sources. Pairing a maxed Defense Ministry with Crimson Ramuh gear will be necessities for obtaining the missing HP when using Gladiolus on defense. Ignis is not a trap hero. However, his mastery skill tree is useful for his limit breaks (Sagefire and Sagefire Overdrive), which provide a large anti-armor or anti-hp shred boost when activated. The Sagefire enchantment (anti-armor shred) can be unlocked at level 200, while the Sagefire Overdrive (anti-hp shred) requires level 260. His mastery skill tree at level 200+ also links with Ignis’ Diner to provide additional benefits. Please see Ignis’ Diner section for a brief overview. Having full legendary gear sets and a Mythic Forge allows you to get passive boosts. Currently, the only relevant sets are Destiny and Ramuh. These should be your main focus. Every boost counts, even the smallest, so obtain every gear set possible for additional boost. Having every gear set, especially Ramuh and Destiny, provides a massive advantage over opponents who don’t have these sets completed. Destiny: The absolute minimum gear needed to defend well. Anything under Grandmaster will not be effective. Ramuh: The most powerful defensive gear in the game at the moment. The higher level gear, the better. Ramuh can also now be powered up past legendary similar to the Destiny gear sets. Aegis: The Aegis sets boost are minimal in comparison to even the basic Ramuh. However, the boots are a great way to get anti-armor shred if you don’t have a Reapertail defensive monster. Gilgamesh: The Gilgamesh weapon, although not the best defensive weapon it is still a top contender. If you don’t have a Primal Destiny sword or Ramuh staff, this makes a great alternative. The gear you equip during combat will depend on the rest of your setup. Do you have a high level Reapertail? If so, you can use that in your wall. This allows you to use the best gear available to you with the highest attack/hp/armor boost. Minimum gear suggested would be Primal Destiny gear; however, Ramuh gear is a better overall defensive set. Mixing a piece of Primal Destiny gear, such as the boots (for attack) or the chest (for armor) with Ramuh also helps defensively. For your weapon, you want to use the weapon with highest troop attack. Attacker Ramuh is my choice. Aim for at least 15 million% total armor so you can maximize Gladiolus’ Spiked Armor II skill (minimum level 206 required). With the rest of your gear, I would recommend using a mix of defender, balanced and attack Ramuh gear to maximize your stats. Always look to maximize your troop attack as the first priority, followed by HP and then Armor (after having 15mil% armor for Gladio setup) below is a picture of a gear setup that works effectively to date. If you don’t have a high level Reapertail, alternatively you need to use the legendary Aegis boots. Combined with maxed crafting bonus this will provide 35% Anti-Armor Shred bonus. You can also utilize Ignis limit break (as discussed earlier), but that adds an extra step, and time is precious when someone is tapping the speedup button furiously. Sometimes it’s only seconds before you get hit. Keep in mind the enchantment materials are not the easiest to come by although they are out there (Moogle market, realm bosses, monster hunting, etc.) so this is not ideal solution. Always aim for permanent boosts first. Utilizing the right gems can greatly impact your defense. Assuming you have max level gems, the best setup currently uses Lucky (troop attack) and Unlucky gems (troop resistance), Elemental gems (Elemental attack and attack against), and Paragon Protector gems (all max level 10). Flux (city defense armor when astral is present) also work well if your other gems are not maxed. Another effective option would be Earth Elemental gems. With Gladiolus’ mastery earth skills and his limit break you should be able to add massive amounts of Attack and HP boost while limit break is active. As mentioned at the start, Luna’s multi-astral defense is required to defeat large march sizes. Ideally, you’d want all astral at max level for use with Luna and her multi-astral defense skill. If you haven’t leveled Luna to 230+, Ifrit is a good alternative due to his troop attack vs astral nullification. A high-level Shiva (level 101+) could possibly act as a better defense astral in the future as astral levels continue to increase. A troop capacity of 500 million or more is required to zero large march sizes with a dead astral. With the new Ignis fire boosts and Gladiolus earth mastery, I would lean heavy earth and fire troops. However, with all astral unlocked an even elemental spread might work as well. This setup needs more testing as Ignis mastery 200+ is relatively new. This new research tree not only allows for a new troop type, with the weakest troop being just about as powerful as t10, but also provides research that increases troop boosts. Some of the largest boost sizes the game has seen so far stem from the monster troop research tree. To kill some of the most powerful rallies in the game you will need this research tree completed. Level 10 Mercenary Pits is a huge asset, which allows you to protect 2 million mercenaries separate from the normal hospital. If you are using Undying or Shadow guardians, you will need 2 million combined, and no other mercenaries. This will protect your very valuable troops. It seems that roughly 60mil% HP (in my case I use Iris limit break) will be needed before a strong attacker can get anywhere close to breaking through 2 million Undying or Shadow Guards. If you are caught offline, or you are unable to heal your injured troops, the second hit will burn you without additional guards or a higher HP boost. If you only have one Crystal Core slot available utilize the Quartz core while defending. Should the additional core slots be available utilize the following: Immovable Core (secondary core), Unstoppable (third core), and Mythril Protection (fourth core). At this stage of the game a level one or two Defense Ministry is minimum. The higher the level, the better as it boosts your troop HP and Armor tremendously. To defend against the large rallies, you will need this maxed (level 10). Ignis diner seems to be a promising way to temporarily boost attack and defense stats. Need an extra kick when being rallied? Stop at the diner before the rally hits for a stat boostingly delicious meal. Ignis mastery now has research that enables the ability to obtain diner chests from monster drops, as well as Luna providing gifts containing chests. The stats from some basic recipes carry extremely powerful boosts with millions of %. These will be required for rallies vs very powerful attackers as they will be using them as well. Deadly and Gargantuan Reapertail: The most important for anti-armor shred. Without this monster, you need to choose between using Ignis Sage Fire 1 (anti-armor shred) or the new Sage Fire Overload enchantment (anti-HP shred). Five Star Level 10 has 100% anti-armor shred. Deadly and Gargantuan Bandersnatch: Great monsters for their attack shred and anti-attack shred boosts as well as troop attack boosts. VIP level 120 or very close to it can be attained from event prizes when they are running. This is a good place to start. A higher-level VIP can be better but as a trap you don’t want to look too strong. I currently sit at level 126. There are many components and variables which allow a low-level citadel to be a successful trap, killing all incoming rallies, marches, and capturing Heroes (if attacker is not using an uncaptureable hero boost). To beat the most powerful opponents you will need the new monster research as well as Ignis diner/Ignis 200+, either high-level Gladiolus or Luna with Crimson Ramuh gear, and maxed level gems. There are still many other factors to consider that contribute to the outcome of the battle. Please leave any comments or suggestions, corrections, or alternate strategies in comments. Thank you Brickz for taking the time to speak with us, and writing such a fantastic and detailed guide! Do you have anyone to nominate for our monthly Player Profile? Let us know below!